GRIFFIN - Gamma-Ray Infrastructure For Fundamental Investigations of Nuclei - is a state-of-the-art facility for decay spectroscopy with rare-isotope beams located at the TRIUMF-ISAC-I facility, Vancouver, Canada. An array of 16 high-purity germanium clover detectors coupled to a fully digital data acquisition system dramatically increases gamma-ray detection efficiency and data aquisition throughput over past experiments, while leveraging a powerful suite of ancillary detectors developed for its predecessor, the 8pi spectrometer. 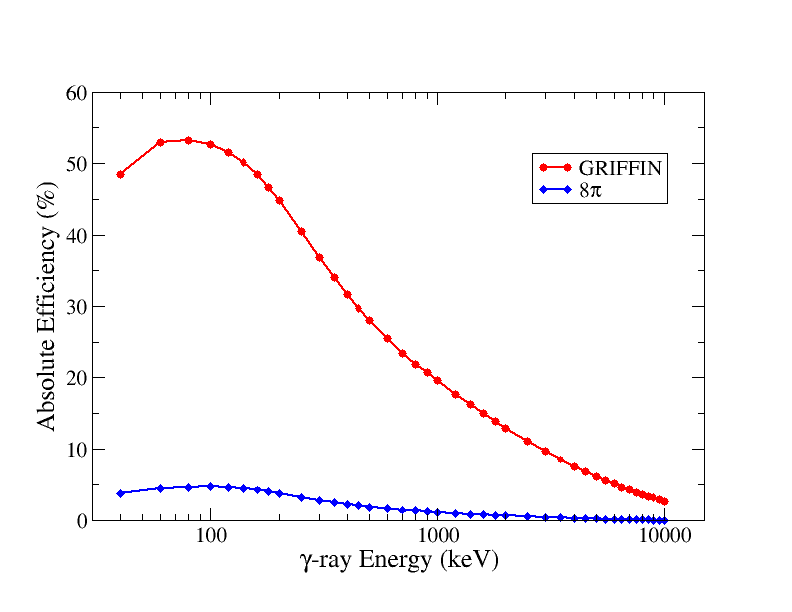 GRIFFIN is 17 times more efficient in gamma-ray singles (almost 300 times more efficiency for gamma-gamma coincidences) at 1 MeV, and around 40 times more efficient at 10 MeV, than its predacesor. The GRIFFIN DAQ is capable of writing up to 200 TB of data to disk every week - allowing the exploration of rarer processes than ever before. The GRIFFIN Toolkit is a suite of web apps built for designing, understanding and running experiments at GRIFFIN, all on the web. Check out our tools, or look under the hood - all GRIFFIN web projects are open source on GitHub.